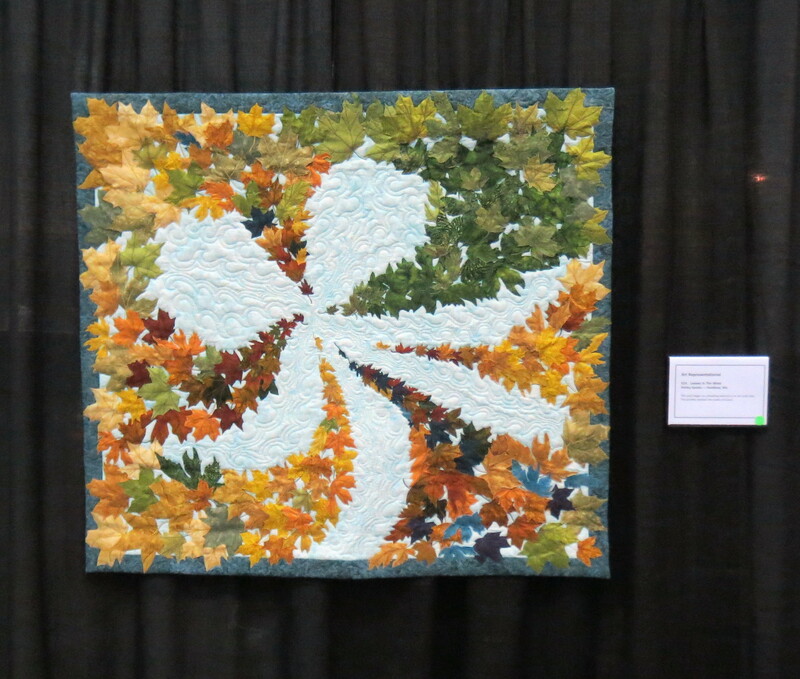 Last week I volunteered at the Pacific West Quilt Show for the first time. I would encourage all of you to volunteer at a major quilt show at least once. I certainly appreciated the show more for having seen the effort involved. Many of our well known local quilt instructors and authors were in attendance. I was impressed that these ladies, so busy teaching classes, writing books, etc., would contribute so much time to the show. I helped hang the quilts in the main exhibition hall on Thursday. Heidi Lund was in charge of the quilt hanging and maintained amazing calm considering the chaos. I took a wonderful class from Heidi a few years ago. She is a real master with thread, and some of you may have seen her spectacular garments in wearable art shows. In the morning I worked with Maggie Ball (www.dragonflyquilts.com ) and another quilter named Val whose last name I didn’t learn. They were a pleasure to work with and had hung the quilts before, so we made lots of progress. Seeing the quilts up close and personal during the hanging (especially the backs of the quilts, mostly not visible during the actual show) helped us appreciate the incredible skills of the quilt makers. On Friday morning I was at the volunteer desk, checking in the many volunteers working the show. Susan Purney-Mark was in charge and did a great job directing the volunteers and solving the many small problems that came up. Susan had taught a class the day before and said she volunteers for the duration of the show every year. In the few quiet moments, she graciously offered advice about book publishing, blogs, etc. I really enjoyed our conversation. Check out Susan’s website, ( http://www.susanpm.com ) and her blog (www.susanpm.blogspot.com ) for some really interesting info on fabric painting, stenciling, coming up with original quilt designs, etc. 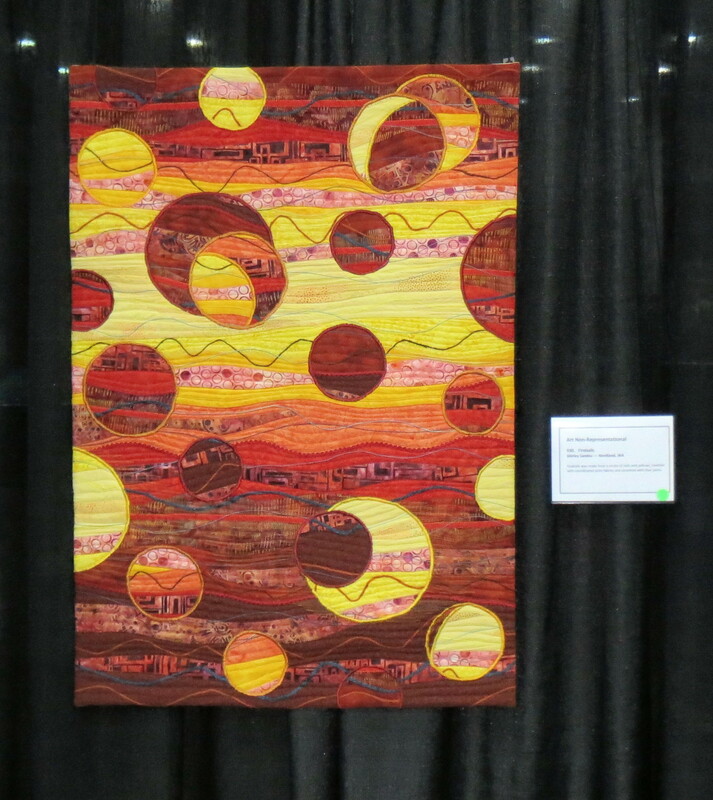 I am not sure if there are restrictions about publishing photos of other quilters work here, so I will include a couple of photos of my quilts hanging in the show and no others. There were as usual many spectacular quilts. I am always astounded by the amazing skill and patience shown by the makers of the winning quilts. I expect there will be photos of the winning quilts available online fairly soon. My quilts from the show arrived back at my house on Tuesday about noon, so the quilt return process was conducted with the same efficiency as the rest of the show. The judge’s comments on my quilts were included with the returned quilts and were both encouraging and helpful. Congratulations to show director Elizabeth Spannring (www.plaidcat.com) and the rest of the team for all their great work! This entry was posted in Art Quilts, Contemporary Quilts, Pacific West Quilt Show, Quilt hanging, Quilt Show, Quilting and tagged art quilts, contemporary quilts, Pacific West Quilt Show, quilt show on August 29, 2013 by Shirley at Mystery Bay Quilt Design. Wow, this is gorgeous! I love the colors and your approach.